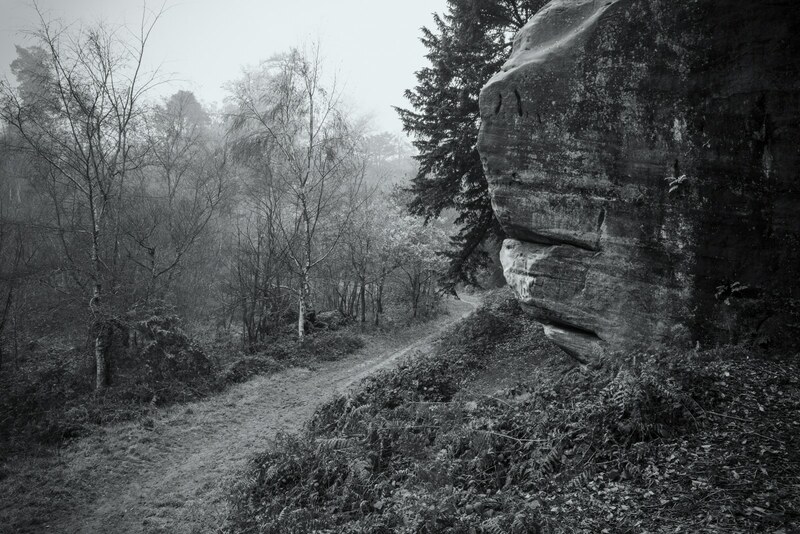 I admit I was slow to discover the amazing sandstone formations dotted throughout the Kent and Sussex Countryside. Naturally I am drawn to Landscapes that offer something different to the norm. 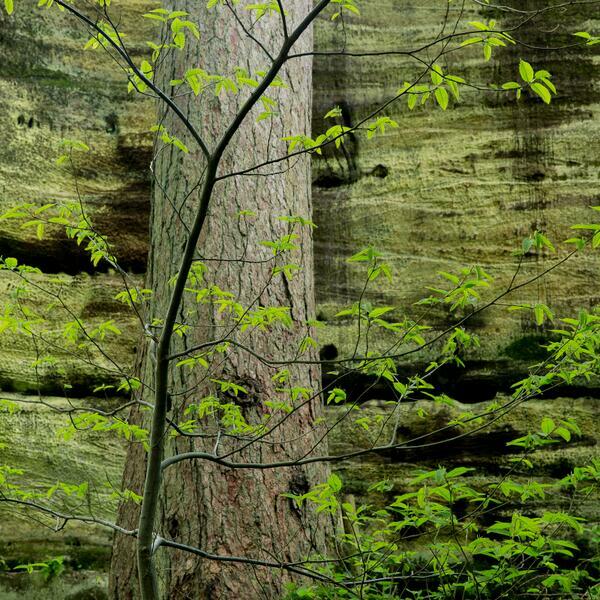 These stunning sandstone formations and the ancient woodland that surrounds them are certainly worth a visit. There is a strong coastal bias in many of my images but as a photographer I’m always looking for new and differing landscapes. 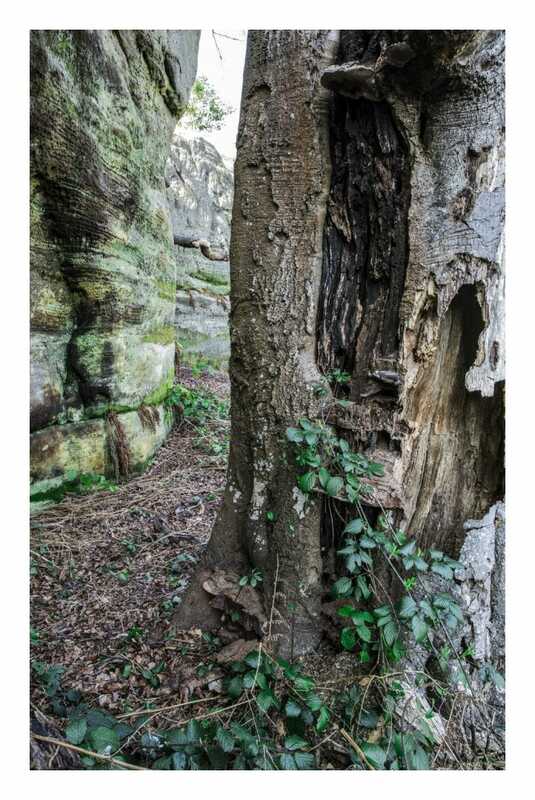 At the various sites throughout Kent and Sussex you will find great photographic interest not only in the wider landscape but also in the details within the rocks themselves and the flora and fauna that surround them. 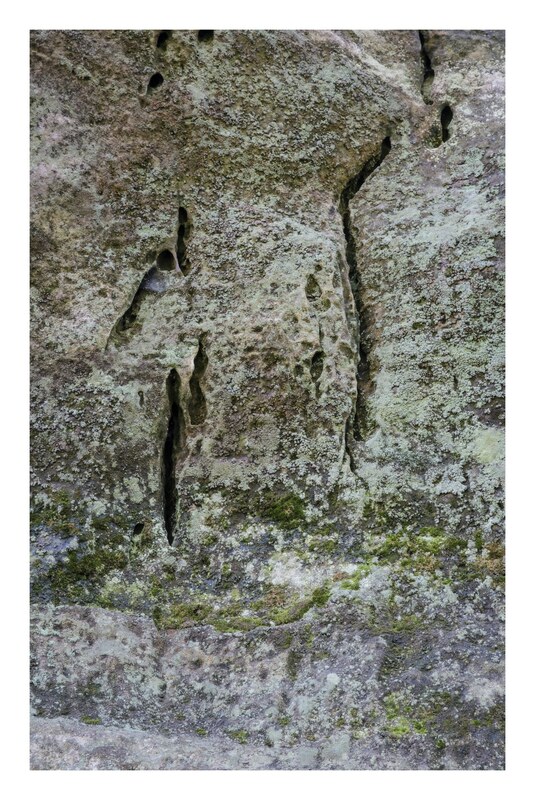 Hopefully this piece will provide you an insight into what you might find at some of the sites and showcase some of the work I have been doing. 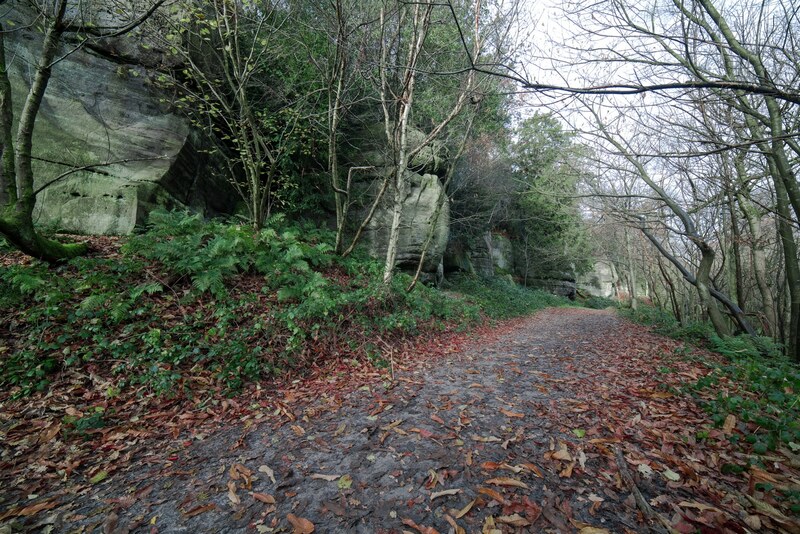 Eridge Rocks are managed by The Sussex Wildlife Trust as a Nature Reserve and they are an altogether ‘wilder’ and more natural offering than High Rocks. They are also a Site of Special Scientific Interest. The small carpark popular with dog walkers is reached by turning down the pothole strewn (Update 21/03/2014 – Most potholes filled) Warren Farm Lane next to the Church in Eridge. 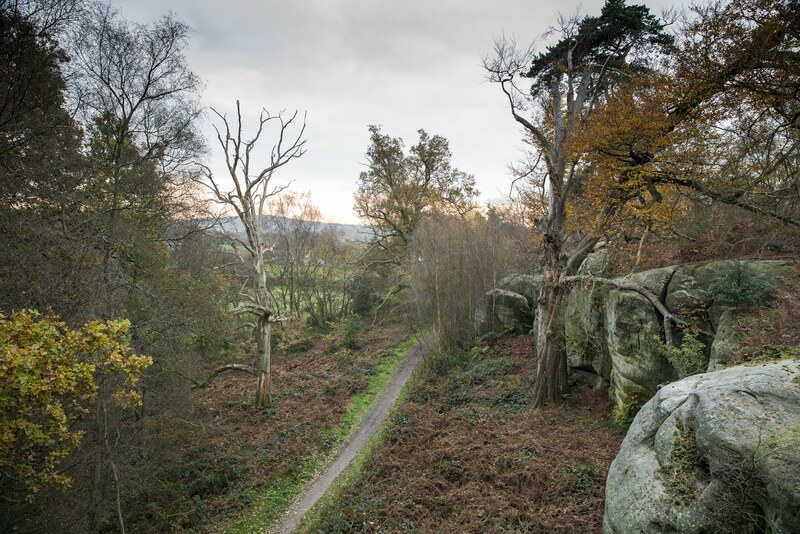 Eridge Rocks is a beautiful spot offering great walks and lots of varying flora and fauna in a wonderful setting. The area has an almost prehistoric feel to it. 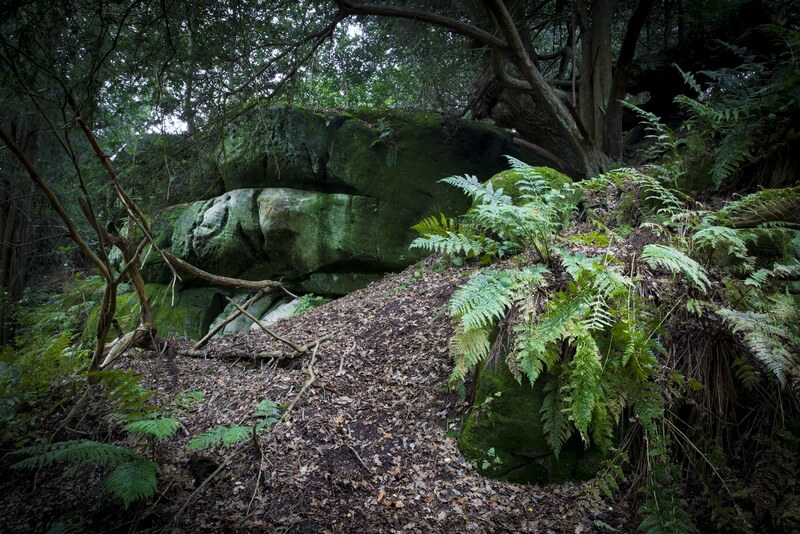 The differing forms, textures and hues within the sandstone blend beautifully within the ancient woodland setting. The area took a bit of a beating in the recent bad weather which is a shame and a good few trees were lost further down the path. 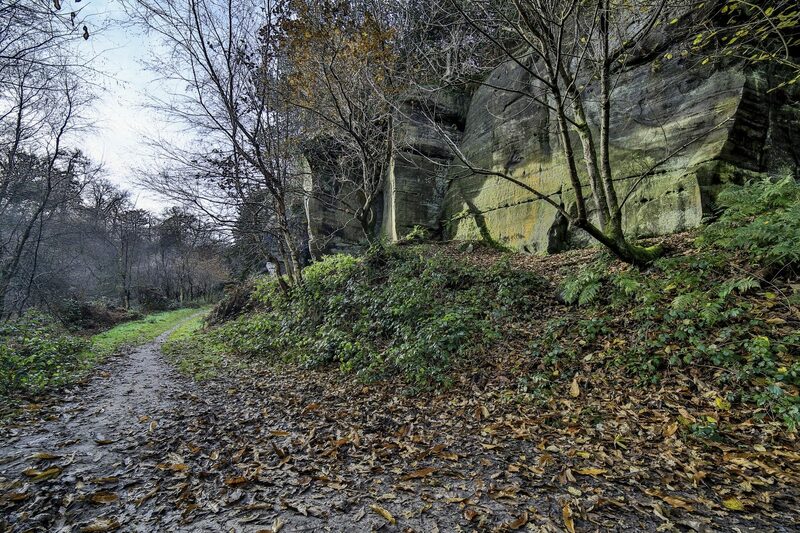 Also a section of the path has collapsed and is currently fenced off, so take care. At present dog fouling is a real issue, so take extra care where you step. 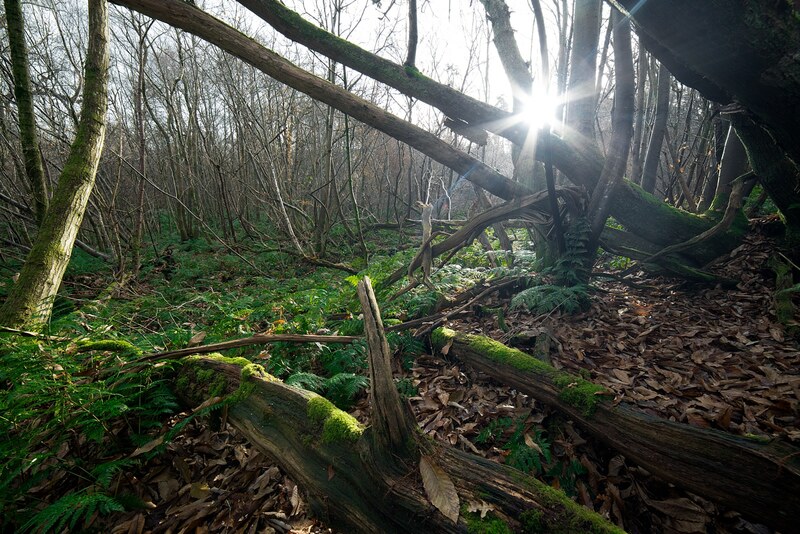 It is something that The Sussex Wildlife Trust are looking into at the moment. The rocks demand your attention which can lead to accidents. On every visit I’ve fallen foul (no pun intended) of this problem because I’m always looking for a photo. My last visit on Friday last week, ended up with me hobbling about in the woods trying to clean dog poo from the handle of one of my crutches. I’m surprised (perhaps I’m not..) that within a nature reserve some dog walkers have so little respect for the environment or fellow users. The law does not specify that in areas such as this dog walkers are required to clean up after themselves, so clear signage and an awareness campaign will be a great benefit. Dogs are often walked off the leash so if you are nervous around dogs do be aware of this. Most are friendly and well behaved! Apart from this temporary problem it is a truly lovely area and it is worth exploring off the main path. Take care on the rocks and slopes as they can be slippy and where possible, try to keep to the paths dotted around, so not to adversely effect the abundant wildlife. The woods are full of wildlife, if you are there early and you are quiet, then of course there are plenty of deer about. I watched yesterday as a bird of prey, probably a Sparrow Hawk, chased wood pigeons above the tree tops. There are currently no dustbins within the car park so please take your littler with you and clean up after yourselves. Certain sections of the path are quite muddy so wellies are sensible. 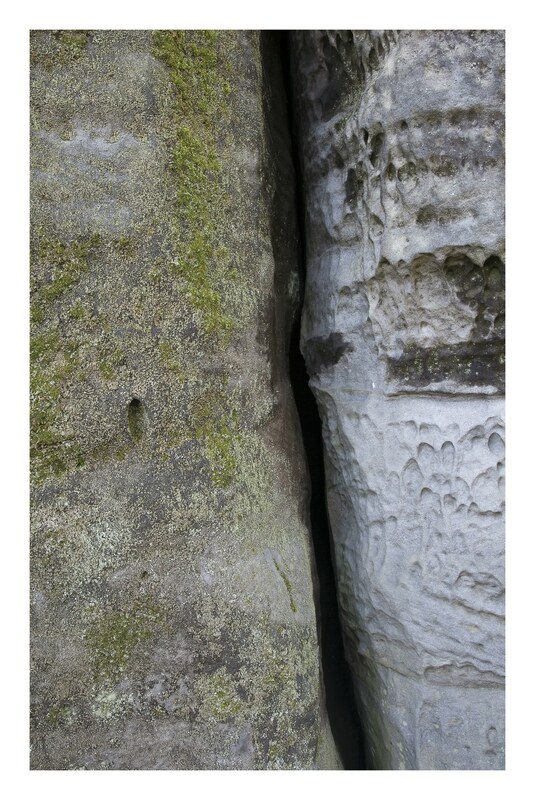 I’ve been photographing the site for a couple of months now and I always find something different to focus on. 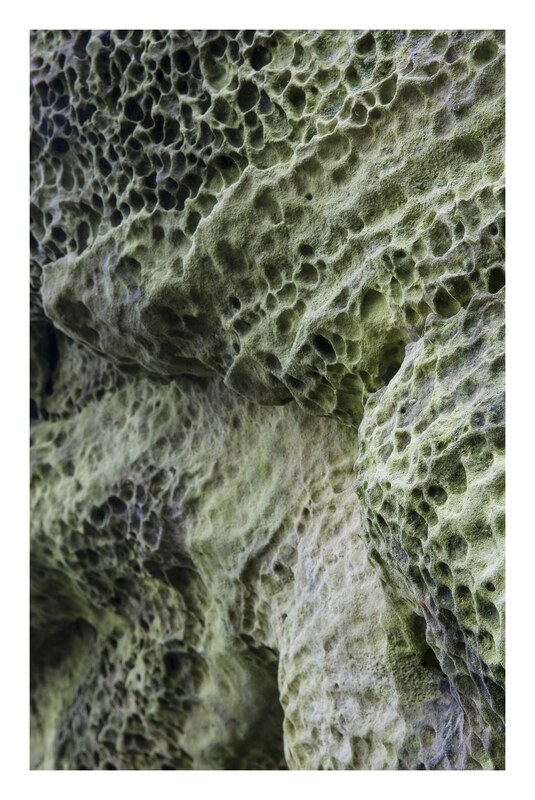 Recently I have been exploring the textures, tones and striations in the rock. 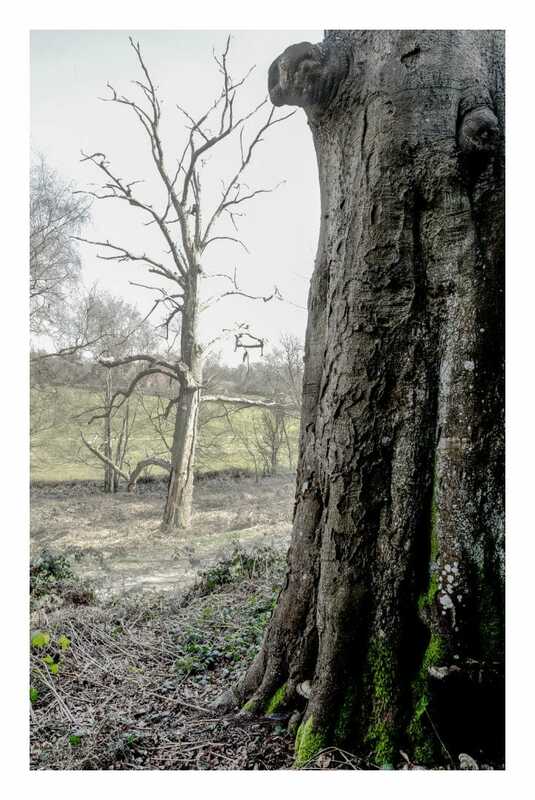 I’ve been looking at how tree and stone interact and trying to give a sense of the very different feel to the ancient woodland. I hope to make an exhibition of the work I have created, to attract others to explore this wonderful resource on our doorsteps. 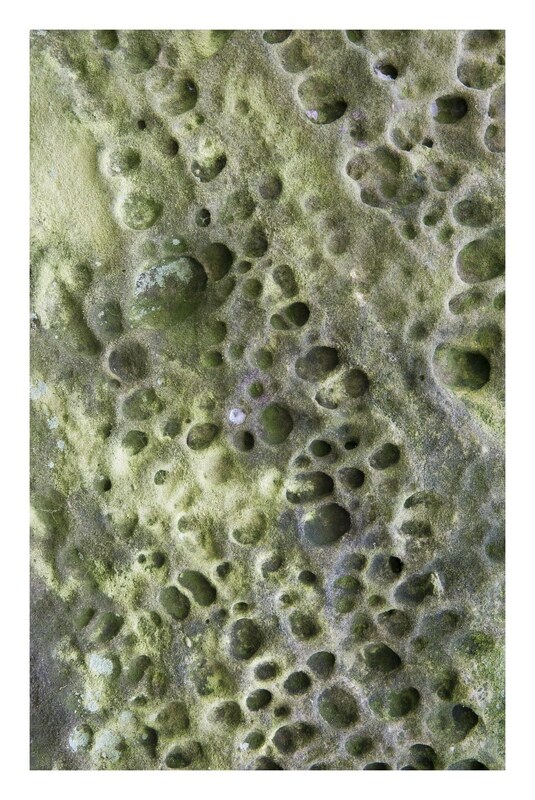 I like to get close up and capture the detail in the varying sandstone. 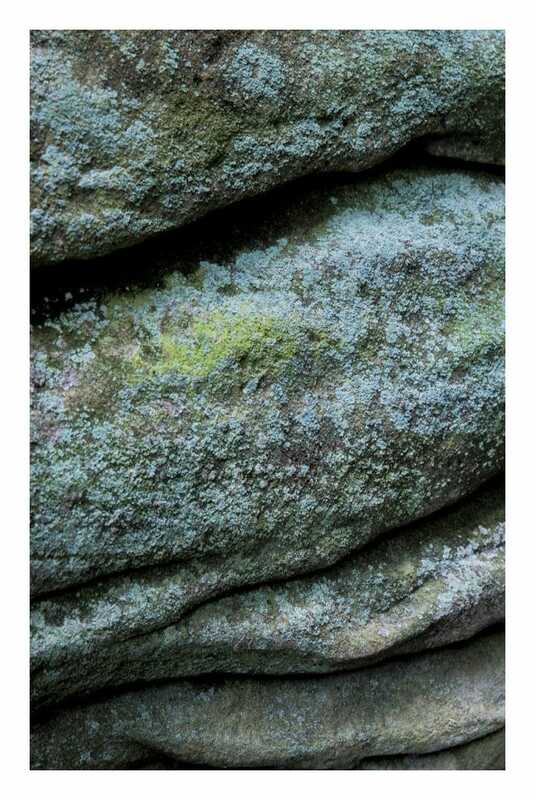 The textures, striations, mosses and lichens create such a rich canvas of colour and interest. As much of the site nearer the rocks is sloped it helps to pack a sturdy tripod with adjustable legs. I opt to shoot with my Canon 5D MK III and i tend to work with either an EF 24-70mm f2.8 L Mk III or an EF 70-200 f2.8 L. These lenses gives me the ability to get closer but also to pick out detail higher int he rock faces. I usually work with the mirror locked up and use a remote release to achieve the best results. 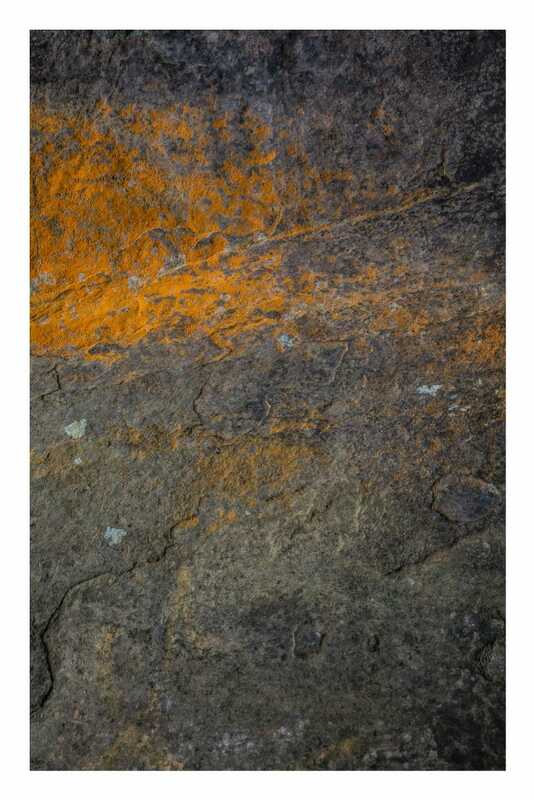 When creating more abstract images of the rocks it pays to look for ‘interest’, leading lines, contrasting textures within the frame, much as you would shooting a landscape. I tend to see the Landscape in a very varied way, as a very broad collection of tones, textures, tighter crops and wider views. It has never been just one thing to me, one style of creating an image. 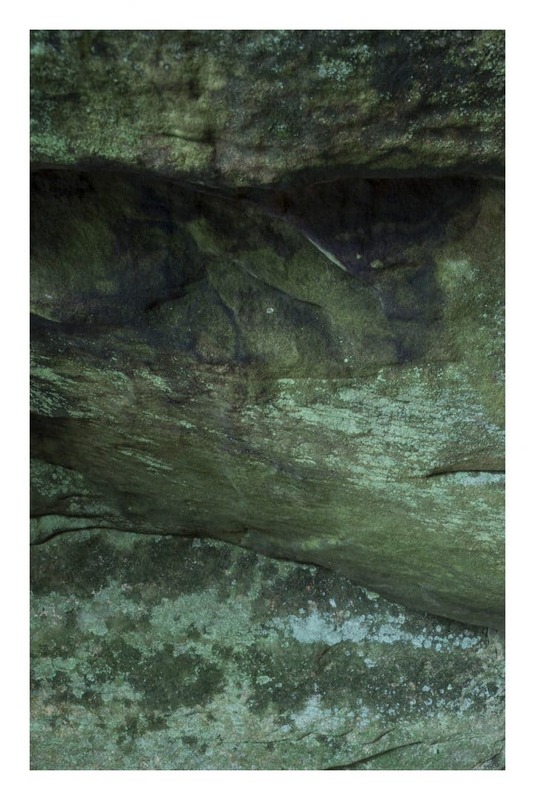 More a constantly evolving representation of how I feel about the landscape at the time I shoot it. To promote front to back sharpness with these rock faces I will usually work at f11 to f14. With digital cameras working beyond an aperture of f16 diffraction will start to soften images. 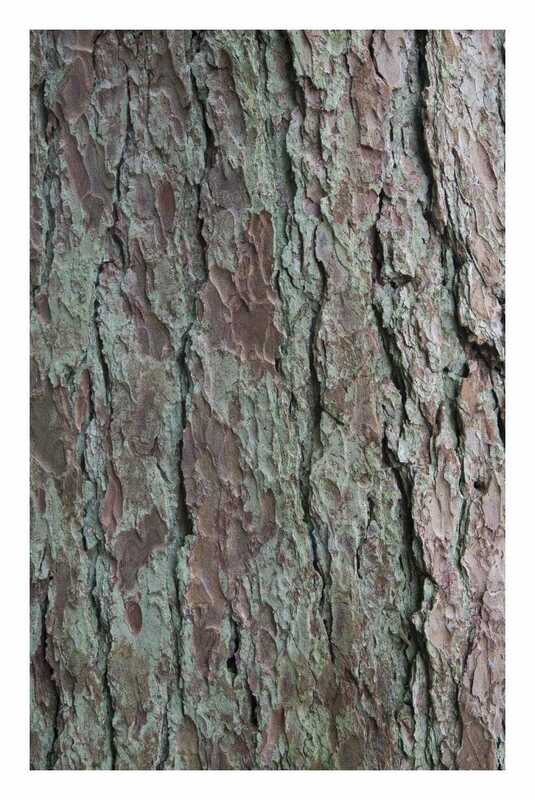 As most lenses are at their sharpest just a few stops up from wide open you can look at ‘focus stacking’. Take multiple identical frames of the same images shifting the focus point manually from foreground, midground to distance and then combine them using focus stacking software. It is by no means a magic bullet but a technique I sometimes use to achieve sharp images front to back . As most lenses are not pin sharp corner to corner, it can pay to frame slightly wider than you intend and then crop when editing. Work with differing apertures at different points, get close and shoot side at interesting angles. Be Creative. 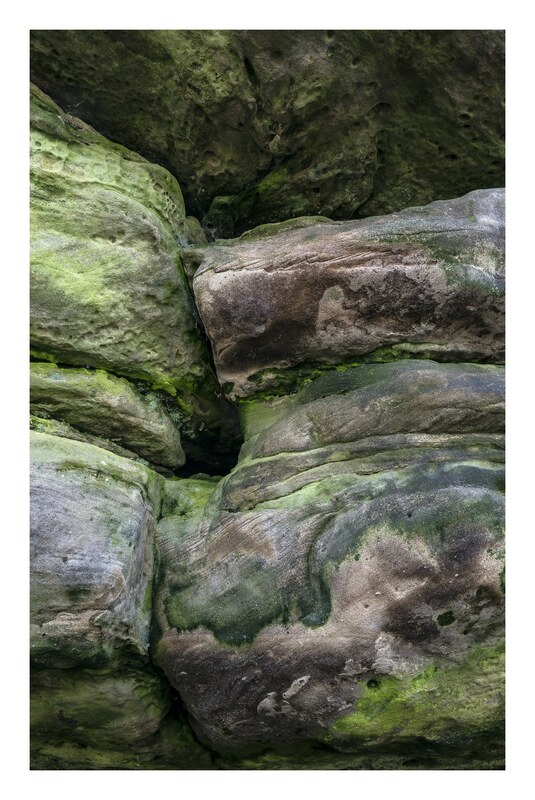 I will be running Landscape Photography Workshops at Eridge Rocks over the coming months, where I will provide instruction, on how to photograph the rocks and the wider landscape. Showing you how to get the best out of your cameras and to create some exciting images. 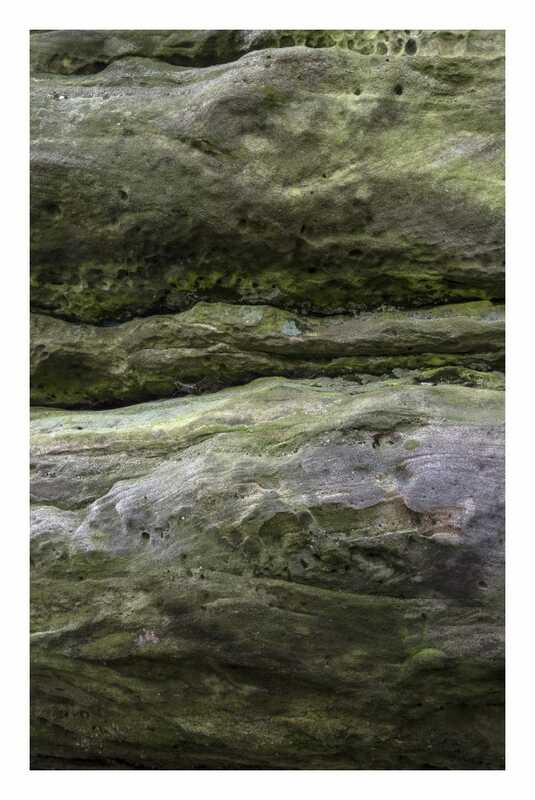 This entry was posted in Landscape Tips and tagged "photography tuition", "photography workshops", 1 to 1 photography tuition, abstracts, ardingly sandstone, Bio Diversity Sussex, Eridge, Eridge Rocks, geology, High Rocks, landscape photography workshops, landscapes, rich clark images, sandstone outcrops, sussex wildlife, Sussex Wildlife Trust, Tunbridge Wells Photography, woodland photography.